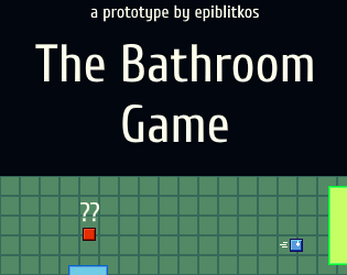 This game prototype is inspired by how frustrating it can be at work when one has to "go" only to find the bathrooms are full. If you've got any feedback on this prototype, be sure to comment below or tweet @games_by_epi! Thanks! WASD keys or arrow keys to move. Balance the need to go against getting work done. Other coworkers occupy the bathroom (yellow rectangle) from time to time, and the manager (circle) comes around to check whose working and whose goofing off. Make sure to be at your desk when they come around! Score points for getting work done, and try to make it till 5:00pm without having an accident or getting fired! Be sure to get your work done, but when you gotta go, you gotta go!